Los Angeles is home to some of the most creative food, and dessert is no exceptive. All across the city, quirky new shops have been sprouting up with trendy, Instagram-worthy desserts. From gorgeous ice-cream burritos to bacon covered mini-cakes, there has been a surge these snazzy new treats. But if it’s Instagrammable, does that automatically mean it’s good? We’re here to break down all the hype and lead you to a delicious destination. Nestled between a lively food court and a 1920s-themed nightclub, this hip ice-cream shop has garnered a lot of attention for one unique ice-cream option: black soft-serve! The creamery uses food coloring to dye one trendy flavor completely black. Ever since the black soft-serve dropped, the charcoal treat has been a top seller, but it isn’t the only fun option in the creamery. 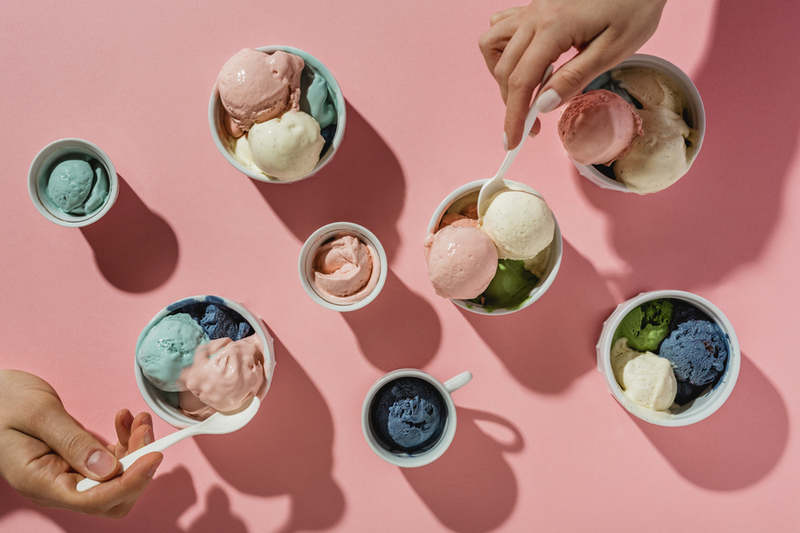 Little Damage offers four colorful flavors, including one vegan option, that provide an alternative to their popular all- black dessert. In fact, the niche ice cream shop makes good use of color throughout the entire store with decorative neon lights that yield their motto, “I licked it, so it’s mine!” A cherry on top of the already Instagram worthy ice cream. However, after a taste-test of every flavor Little Damage had to offer, there was much to be desired. The soft-serve is light and refreshing, but the flavors don’t quite pop. Luckily, the shop changes the flavors seasonally, so there’s always something new and exciting in store. B Sweet breaks the mold by specializing in bread pudding, a traditional but typically uncool dessert. Each week, the geniuses over at B Sweet curate a menu of six innovative bread pudding flavors based on chic foods. Popular February flavors include Ube, the Filipino root vegetable, Samoas and Tagalongs, the Girl Scout cookies. Aside from their delicious bread pudding, B Sweet is also known for their Halos. The Halo is a cold-pressed donut sandwich, that features an ice-cream of your choosing, stuffed inside of a glazed donut. Can you say yum?? B Sweet offers an unprecedented selection of impeccable desserts and every item in this dessert bar is truly a one-of-a-kind creation. The ice cream burrito trend has finally landed in Los Angeles, and it can found at one of the coolest bars in Koreatown. Milk Tavern is both a bar and a full on creamery. On the dessert side of the shop, employees sell soft-serve blended with your choice of cereal, alcohol infused ice-cream, and crepe cakes with rainbow tiers. A few feet away, there’s a full-service bar. The innovative nature of the restaurant is enhanced by gaming systems built into one wall, and bright neon signs on the other. While the tavern is clearly meant to be photographed, the food fortunately holds up as well. The alcohol-infused ice cream was subtle, but delicious. The blended soft-serve was a delectable update to your classic bowl of cereal and milk. The cotton candy burrito was a tad bit too sweet with the cotton candy wrapping, but the ice cream was good. These donuts prove that baked is always better. Fonuts is a dessert bar that offers baked donuts, as opposed to fried, in an assortment of creative flavors and vegan-friendly options. From classic flavors like red velvet, to more eccentric flavors like rosemary olive, Fonuts has a little something for everyone. While the distinctive dough clearly resembles a donut, the consistency is much closer to that of a miniature cake, and flavors like “Strawberry Shortcake” reflect this. Nonetheless, this is surely a little slice of heaven for each customer. The Museum of Ice Cream is the mecca of Instagrammable desserts. This pop-up museum first made waves in New York City back in 2016 when people realized the interactive museum offered lots of ice cream and tons of photo opportunities. While it isn’t necessarily a dessert bar, the museum is a creamery in every rite. (Spoiler alert!) The museum offers everything from traditional scoops of ice cream, which change on a weekly basis, to more complex green tea mochi, and even pink soft-serve. You won’t find a better option for fabulous photos and tasty desserts.